Stoke Works Station opened in 1852 on the GWR Stoke Branch which provided a link between the Midland Railway Birmingham to Bristol main line just to the North of the station, with the GWR's 'Oxford, Worcester & Wolverhampton Branch'. The station was necessitated primarily due to the workforce required at the Stoke Prior Works which today, as opposed to being a 'Salt' works, is largely occuppied by 'Polymer Latex. With the increase in car ownership among the factors, the station closed in 1965. As an aside, the village is an extremely quaint and upmarket hamlet and whilst I was there, every couple of minutes there were articulated tanker trucks and the like hurtling through to and from the works. 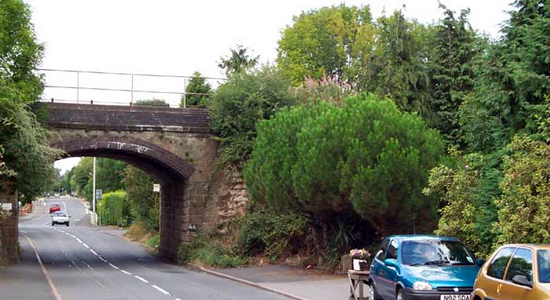 Above we see the Shaw Road bridge - the site of the Stoke Works Station was to the left, August 2003. 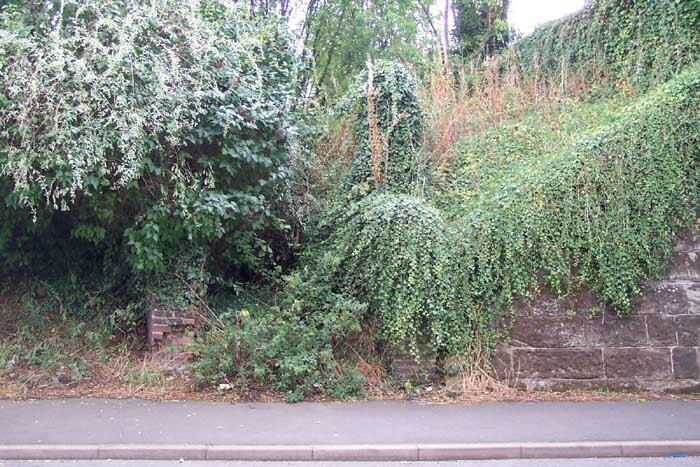 Above-left is the road entrance to Stoke Works Station off Shaw Lane: vegetation renders it impassible today but it can clearly be seen as can, following some rummaging in the undergrowth, a brick wall lining the walkway. 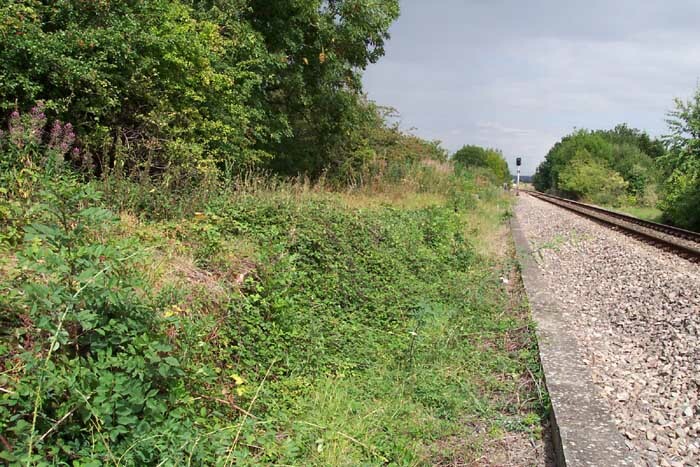 Above-right we are standing on the 'Bromsgrove Platform' looking across the line at what remains of the 'Droitwich Platform' - the entrance shown in the previous picture emereges just at the start of the bushes to the left of the 'Droitwich Platform' spot. Above we are at trackside looking towards the junction with the Midland Railway and Bromsgrove. 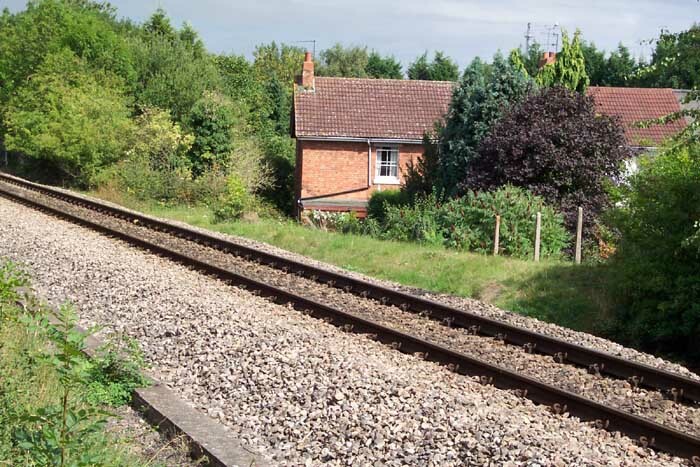 The raised 'bush' running along to our left is in actual fact a bramble-covered blue-brick platform - the line here has been single-tracked since the days of the functioning station hence the platform's apparent distance from the line itself.